Home » Anti-Money Laundering » What do the Dennis Hastert & FIFA Indictments have in Common? In the modern age of bitcoin and computer algorithms, it appears that old-fashioned cash transactions initially tipped off the government to the alleged crimes by former Speaker of the House, Dennis Hastert and FIFA officials. Money laundering can be quite complex. For example, one of the alleged schemes in the FIFA indictment involved moving funds from Miami to a New York correspondent account to a Hong Kong “front company” then back to New York to finally land in a Cayman Islands bank account. But other alleged schemes relied on cash in suitcases. How were the Feds Tipped Off? The indictments of Dennis Hastert and the FIFA soccer officials/associates focuses attention on the federal crime of “structuring” financial transactions to avoid currency reporting requirements. Domestic financial institutions were required to file a Currency Transaction Report (“CTR”) with the United States Department of the Treasury for each transaction in currency, such as a deposit, withdrawal, exchange of currency or other payment or transfer by or through or to such financial institution, in excess of $10,000. “Structuring” a financial transaction was defined as conducting, or attempting to conduct, one or more transactions in currency, in any amount, at one of more financial institutions, on one or more days, in any manner, for the purpose of evading the currency reporting requirements, including without limitation, by breaking down a sum of currency exceeding $10,000 into smaller sums, including sums at or below $10,000 and conducting a currency transaction or a series of currency transactions at or below $10,000. The Hastert indictment outlines a series of initial cash withdrawals well above the $10,000 CTR limit. 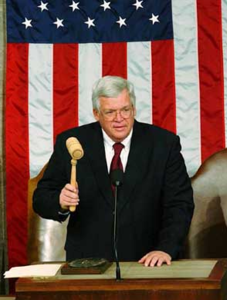 It is alleged that from June 2010 through April 2012, Hastert made fifteen $50,000 cash withdrawals from accounts at Old Second Bank, People’s State Bank and Castle Bank. In April 2012, an un-named bank representative questioned Hastert about the $50,000 cash withdrawals. After the discussion with the bank official, Hastert is alleged to have began withdrawing cash in increments less than $10,000. Note that the $50,000 cash withdrawals had been occurring for almost two years before anyone at the banks questioned Hastert. It is also noteworthy that it wasn’t until after speaking with a bank representative that the alleged structuring began. One of the trails that led prosecutors to allege more than two decades of corruption at FIFA started with a deposit by Daryan Warner at a J.P. Morgan Chase & Co. bank branch in Manhattan, according to a 2012 affidavit unsealed this week. On July 14, 2011, Daryan is said to have tried to deposit €7,500 ($8,178 at current exchange rates) but was warned he would have to fill out a transaction report since the amount was more than $10,000 at the time, triggering anti-money-laundering requirements. Mr. Warner asked for €500 back, according to the affidavit. That red flag, which the affidavit says was later described by the Chase teller to an Internal Revenue Service criminal agent, eventually led Daryan and Daryll Warner to cooperate in the investigation. A significant portion of banks’ anti-money laundering budget is allocated to technology and monitoring systems. These two cases are a good reminder that proper training of front-line staff is also key to detecting suspicious activity.